I received my American Flyer 4-6-6-4 Challenger, Clinchfield 675 on Nov 12, 2011. I have run it every day now having over fifty hours of operating time. The operating features, smoke output, and sounds are terrific. In summary it is the best operating and best looking S Gauge locomotive I have ever owned. 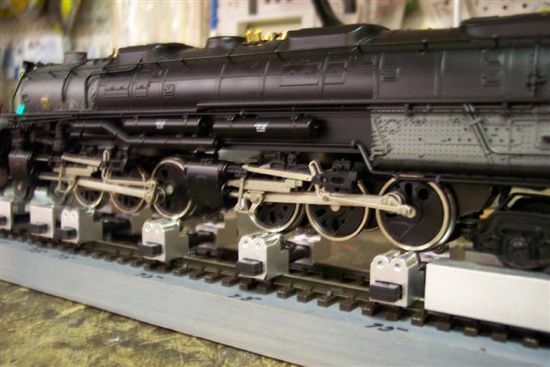 This is all new scale tooling and represents a big step for Lionel in developing the American Flyer Line. All of my concerns with the short comings of the Big Boy have been corrected. These include proper tender design, proper engine trailing truck, proper tender truck, and stance of boiler on chassis. All of the adjustable controls are now easily accessible by removing magnet secured covers on the engine and tender. This is the first Lionel American Flyer piece I have received with the wheels properly gauged according to the NASG flange gauge. However my engine did not come without some issues. It did not include the engineer and firemen figures as advertised. The coupler on the front pilot will not fit any S gauge coupler I am aware of (it almost works with American Models dummy couplers or KD HO #5's), will pivot in only one direction and is installed upside down. The coupler is easy to remove and install in the correct position and it is simple to install a KD or other S scale coupler if you wish to double head. The numbers on the pilot of my Clinchfield engine are those for the 5121 Northern Pacific. All other lettering is correct. My engine arrived with no lubrication on all wheel bearings and linkage. I lubricated all of the above, added smoke fluid and ran the engine on my test rollers for thirty minutes each in forward and reverse. While running I noticed an obvious clunking sound coming from the valve gear and the front drivers were occasionally hesitating. Upon inspection of the side away from me I discovered that the eccentric on the front driver's engineer side was not turning, but just spinning at random. The attachment screw was loose and almost falling out. I positioned the eccentric correctly and tightened the screw. The engine then ran smoothly and quietly smoothing out and speeding up considerably as it completed the break in running. 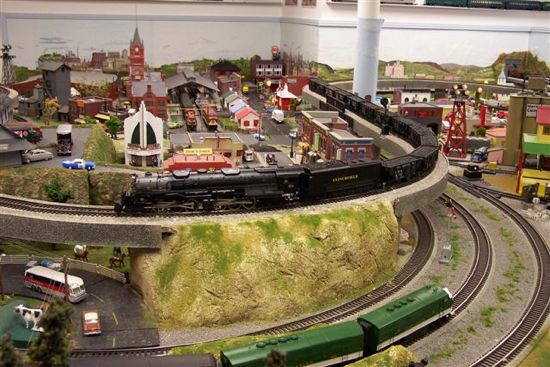 Upon placing the engine on my Tennessee Central layout track 4 (27.5 inch radius) and running it under Legacy control, everything was fine with the engine. However, when I added the tender its front truck derailed whenever entering a right hand turn. Inspection and disassembly of the front tender truck revealed that it would not pivot to the right, but did to the left correctly. I smoothed the pivot arch with a Dremel tool and this helped, but it still did not pivot smoothly. It seemed as if two of the three washers on the pivot post were installed upside down so the smooth sides were not where they should be. Upon reversing them the truck now pivoted much more smoothly, but still better to the left than to the right. After reassembling everything it operated a lot better, but still occasionally derailed on right hand turns. I noticed that the connecting bar on the engine seemed a little high. I adjusted it and the tender bar so that they were as low as possible to clear the track and be perfectly level. All of this solved all of the derailing problems. When I tried the electro coupler it would not release. I lubricated all of its moving parts and pulled it while activating the control. It finally opened. After repeating this procedure about twenty times it was finally freed up and now works correctly. This engine requires slightly wider clearances leaving and entering curves than the Big Boy, especially in reverse. I had to do quite a bit of filing of mountain pass scenery and tunnel portals to allow clearance in forward and reverse. I can now run the Challenger in forward and reverse on track 3 (30 in radius), track 4 (27.5 in. radius) and my transition track to the upper tier. 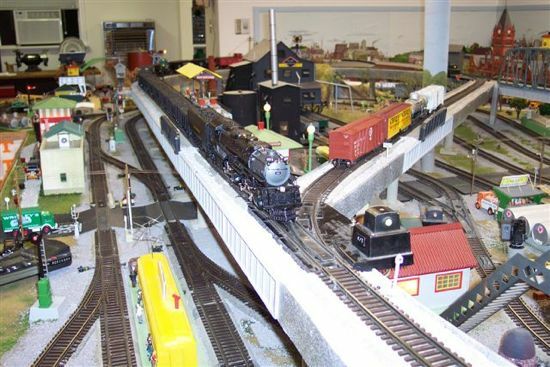 My layout is powered with four American Flyer 12B and three 8B transformers, which are properly phased and wired to a common ground. It utilizes TMCC and Legacy version 1.3 control with five track power controllers (TPC's), seven SC2 switch /accessory controllers, and 2 block power Controllers (BPC's). 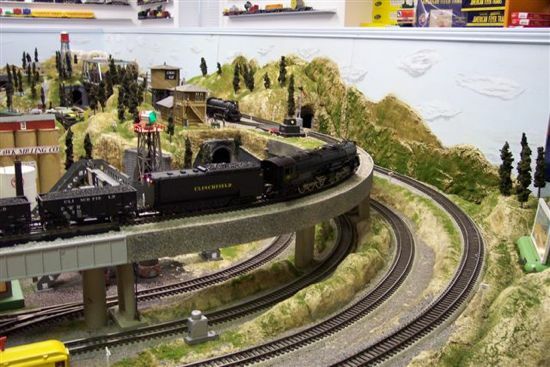 The command base signal is fed to both the base rail and 7-15 volt rail of the track. 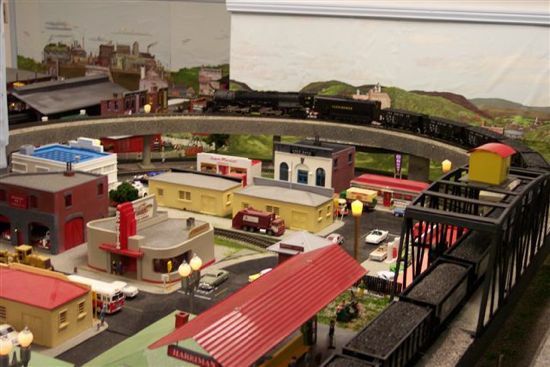 The track is American S Gauge code 172 flex track. with 11 American S Gauge 27" radii turnouts with Tortoise switch machines, and 15	American Flyer 720A turnouts. All engines, turnouts, accessories, reverse loop polarity and blocks can be controlled from either CAB 1 or CAB 2 controllers. 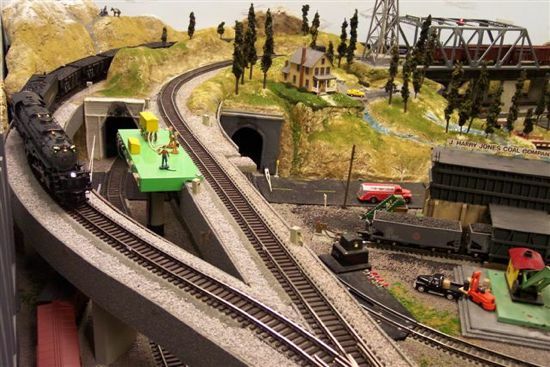 All turnouts are protected from derailments by power routing turnouts. Power routing is accomplished for the American S Gauge turnouts by lever switches mounted on the Tortoise machines. The five tracks are protected with surge protectors and all circuits are protected with quick blow fuses or circuit breakers. All rolling stock utilizes KD or S Helper Service scale S gauge couplers except for a S Helper hirail coupler equipped transition car to connect to the electro coupler on the Challenger or Big Boy engines. Passenger cars use high rail couplers to transverse the Flyer turnouts on the layout. All wheel sets are hi-rail. I have operated the Challenger in conventional, TMCC and Legacy control. It operates satisfactorily in all modes. I have operated it with the Odyssey speed control on and off. Actually this is a new type of speed control which controls both motors. With momentum set in low I experienced some unexpected speed ups and too fast throttle responses. To achieve the best operation I make the following suggestions. If you have Legacy operate with it. Make sure you have upgraded your Legacy system to version 1.3. Number your engine and use the orange module that comes with it to program your Legacy unit. Set your maximum track voltage from the transformer or power supply to the track at around 12 volts. I use this voltage for all modern locomotives operating in command mode as all of them will operate at any reasonable speed at 12 volts. It greatly extends the life of light bulbs, the smoke unit, and reduces the possibility of damage from derailments or other shorts. In Legacy, set momentum to Medium-5 or above, which gives you a much smoother response to throttle changes. In my experience this has eliminated unexpected speed ups. 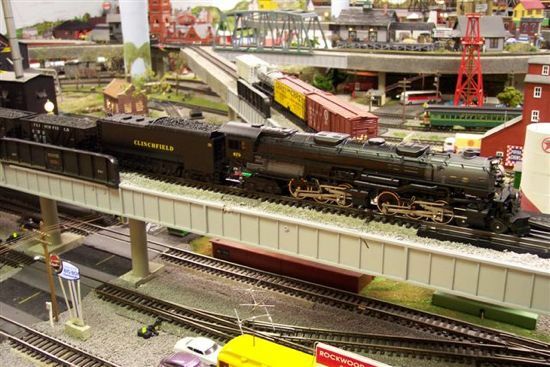 Do not use Railroad Speeds (all except the first are far too fast and some people have experienced erratic behavior even blowing the engines electronics). I have found operation to be far better with the Odyssey speed control turned on. This is the opposite from what some operators have experienced. Don't expect braking sounds as these are not programmed to the Challenger's board. When first started up my engine always comes on in reverse and the electro coupler uncouples. This works out ok as just a short backup re-couples the cars before moving forward. After initial startup the coupler works fine. Also about once every two hours of operation I experience an unexplained speed up of the engine when I blow two long whistle signals at the maximum reach of the whistle controller. My Big Boy does this also. These two idiosyncrasies may be unique to my sample. Consult page 30 of the Challenger's operating manual for directions for selection of the low, medium and high settings of the smoke output as these are achieved differently than with other Legacy locomotives. In reviewing some of the discussion groups on various web sites I see that others have had more significant problems with their engines than I have had. My suggestion is to be patient. If your engine has problems which you cannot easily correct I would arrange to return it to Lionel for repair. The only problem I am now having with my engine is the lack of braking sounds and the improper operation using Railroad Speeds (which I don't use anyway). I think Lionel will correct most of these issues in the future with up dated program modules or Railsounds boards, as they did with early versions of Legacy. In my opinion the engine is such a great addition to the S Gauge line that it is worthwhile to fix any issues rather than returning it for refund as I understand Lionel has offered to do even if your only concern is the missing engineer and fireman.